Valentines Day is just around the corner. In our house, that means a romantic night in. I am sure that many, many of you can relate. Whether you have kids and can’t find a sitter, or just want to stay in- I feel like there is nothing more romantic than creating a sweet night in for your honey. In the week ahead, I am going to be posting lots of recipes for Valentines Day. Some are romantic, some are cute and meant for the kids, and all are meant for celebrating those you love! Like this simple and incredibly delicious homemade shrimp cocktail. I know it’s totally old fashioned, but I am totally a sucker for a really good shrimp cocktail. 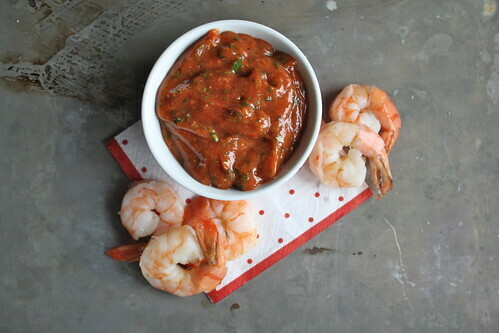 Ice cold, plump shrimp and a super tangy, spicy cocktail sauce laden with hot horseradish. Sooooo good!! Plus, you seriously pay in the neighborhood of 20$ for this as an appetizer and this costs a fraction of that to make at home. My husbands eye’s bugged out when he came home to a platter of this before dinner. 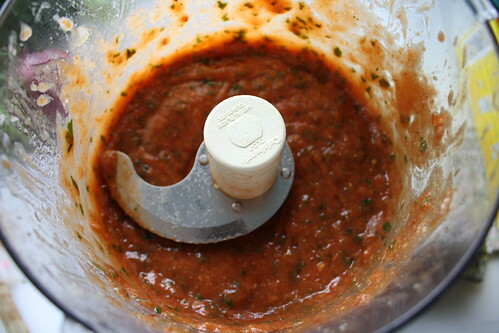 Put all of the ingredients in a food processor and puree until smooth. 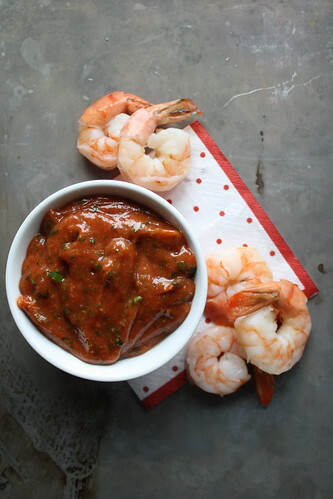 your shrimp look SO good – and i love the flecks of herbs in the sauce! thanks Heather! Those herbs really make that sauce taste so fresh! I am a lover of shrimp cocktail too. I sometimes have remorse when I spend over $15 for a shrimp cocktail app. Thanks for sharing this great recipe! Oh good Allison! Than this one is for you! such a family favorite. your sauce looks amazing! Couldn’t agree with you more, Heather. I love a good shrimp cocktail. It never goes out of style. And my husband and I also do Valentine’s Day at home – so much more romantic. We kick the kids out and have “dinner and a movie”. This year we’ll be screening “Julie & Julia” with a scrumptious homemade dinner and pink champagne. Adorable kelley! I love it. I am going to put the kids down nice and early and give the dog a bone or something and maybe do movie and champagne night too! Great idea! 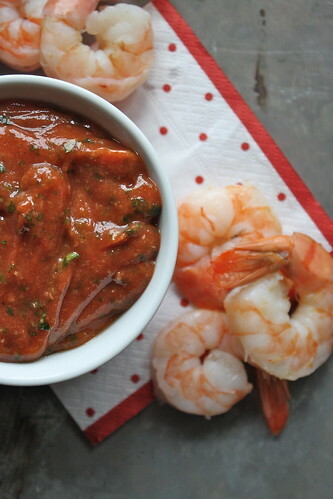 I love shrimp, but I am not usually a fan of cocktail sauce. This would change that! Looks great Heather! Josh loves shrimp cocktail! He’ll love this. Heather, perfect timing–tried it this evening. Delicious!